The extraordinary difficulties in getting a movie made in Hollywood have been well documented. Television shows, books and documentaries dedicated to telling behind-the-scenes stories and the unique struggles in the creation of films are quite prevalent in the realm of entertainment. Getting financing for a film, hiring capable and cooperative actors and choosing a director with the ability to be efficient with time and to stay within a given budget are just a few essential factors in reaching a successful outcome. 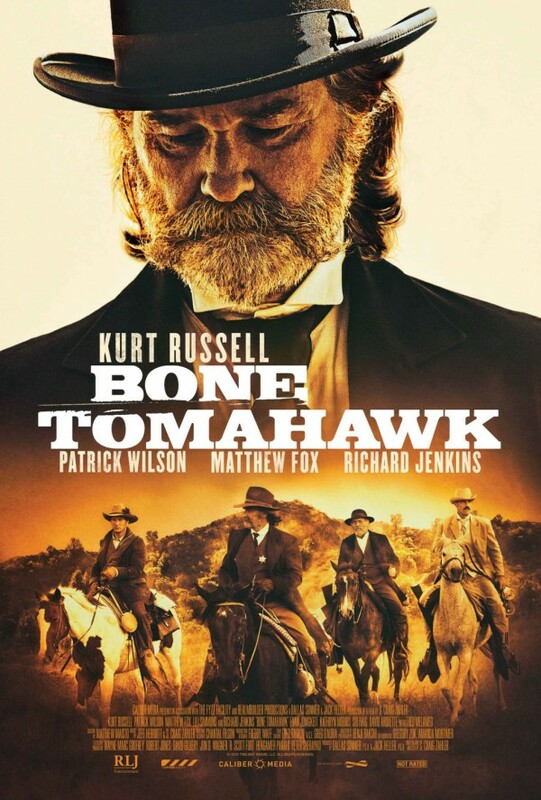 The fact that first-time director S. Craig Zahler filmed BONE TOMAHAWK in three weeks (shooting 16 hour days) on a shoestring budget is miraculous. And what is even more remarkable is that a directorial debut on such a low budget (estimated $1.8 million) could include such an esteemed cast of A-list talent. Kurt Russell leads an impressive ensemble of actors portraying clearly-defined and well-developed characters in what very well could be the first and quintessential film of the Western/Horror genre. Set in the wild west in the late 1800s, the serene frontier town of Bright Hope is visited by a suspicious stranger who's prior transgressions result in unprecedented terror descending upon the innocent townsfolk. Along with the stranger (a cold-blooded David Arquette), a pair of Bright Hope citizens are abducted by a savage group of Troglodytes; a particularly vile breed of cannibalistic cave-dwelling Indians. At the heart of the film is a posse of four men who are tasked with a five day journey and a seemingly impossible rescue mission, all the while facing the obstacles of perilous terrain: Mexican bandits, ruthless Indians and the brutal elements of mother nature. The posse's leader is Sheriff Franklin Hunt (Russell), a grizzled, “shoot first, ask questions later” type lawman clearly in control of his small town. He is joined by his dim-witted and often unintentionally hilarious backup deputy Chicory, played masterfully by the great Richard Jenkins. Patrick Wilson is Arthur O'Dwyer; a righteous, God-fearing cowboy hobbled by a badly broken leg from a roofing mishap, who joins the posse determined to save his kidnapped wife (Lili Simmons). Rounding out the crew is a stellar Matthew Fox as John Brooder, a prickly, yet charming gunslinger with a cavalier attitude and a penchant for killing Indians. Effective and notable in smaller roles are Sid Haig, Sean Young and James Tolkan, who you might remember as Principal Strickland in BACK TO THE FUTURE. Writer/Director S. Craig Zahler's personal success story is characterized by diverse creativity, persistence and ambition. He's been a songwriter/drummer in doom metal band REALMBUILDER, a music critic, a theater director, a cinematographer, a novelist with four published books to his name and may be the poster boy for writers of the unproduced script. Astoundingly, Zahler has written and sold over 20 screenplays that unfortunately have not been made into movies. But Zahler's future is indeed bright, as he has secured a three picture deal with Warner Brothers and is rumored to have future collaborations with Chan-wook Park (OLDBOY) and Michael Mann (HEAT). 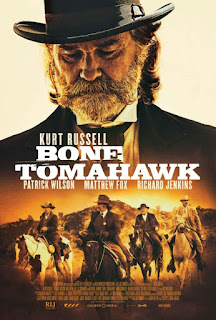 BONE TOMAHAWK is a classic Western in the sense that it's good guys against bad guys; a Cowboy and Indian tale that unfolds at a calculated pace and is beautifully shot in those wide open, arid, rocky and barren landscapes so familiar to the genre. Zahler's old west lingo is faithful, clever and often very funny. Jenkins' lines ("That tea smells gruesome") frequently bring welcome comic relief to situations that are perpetually dire. But the elements of visual violence that Zahler intertwines with the typical western themes are what makes this film so unique and refreshing. A fright fanatic who as a youngster had his bedroom walls plastered with horror posters and images plucked from the pages of FANGORIA, Zahler bludgeons the audience with jarring gore that is realistic, shocking and memorable. There is one definitive scene that this movie will forever be remembered for and many viewers will certainly not be able to handle the horror. A crowning achievement in cinematic carnage. 3 ½ out of 4 stars.